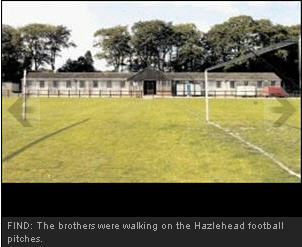 UFO crash lands in Aberdeen! 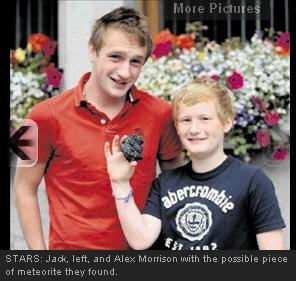 TWO brothers have discovered what could be a meteorite in Aberdeen. Jack, 18, and Alex Morrison, of Aberdeen’s West End, were walking their dog Sally when they came across what they think could be a meteorite. Alex, 12, who will start at Aberdeen Grammar School next week, said: “I was walking my dog at Hazlehead football pitches when I saw the rock. Clear skies allowed Aberdeen’s stargazers a dazzling view of the “natural fireworks” of the Perseid meteors in action earlier this week. The Perseids meteors are so called because they radiate from the Perseus constellation. The meteors are formed by cosmic dust from the Swift-Tuttle comet, which flies past the Earth every 135 years or so. As the comet – a giant ball of dirty ice – travels through space it disintegrates and leaves a huge band of dust. President of Aberdeen Astronomical Society Torcuill Torrance said a meteor find was very rare. He said: “A meteor would smell like sparklers or fireworks. “It would have one rough side and one smooth side caused by dropping through the atmosphere. “It would look melted and black, like it had been in a fire. Mr Torrance said chemical analysis would have to be carried out to identify what the Aberdeen brothers’ find was.